I didn’t think I could be any more shocked than when I miraculously won the 2008 Leacock Medal for The Best Laid Plans. Wrong. When my name was called from the podium this afternoon in Orillia as the winner of the 2015 Leacock Medal for No Relation, I really didn’t know what had hit me. Had I heard correctly? Was that my name? Yes, and yes. I honestly didn’t think I was going to win. I can’t really explain why I felt that way, but I was convinced it wouldn’t happen this time around. And I was quite happy with that. I was thrilled to be a finalist. But it was in fact my name I’d just heard. It was. I stood up, walked to the podium, shook hands with Leacock Associates President Mike Hill, and then strung together an ill-prepared (actually, ill-prepared is generous — it was unprepared) assembly of sentences to try to express my deep gratitude for this unexpected honour. I’m still processing it all, but suffice it to say that I’m over the moon. As I said in my impromptu acceptance remarks, all roads in my writing life lead straight to Orillia and the Leacock Medal. I suspect that every Leacock winner in the award’s 68 year history has been grateful. How could they not be? But I can pretty well guarantee that no winner has been more grateful than I. Up in Orillia this morning, the wonderful folks who kindle the Leacock flame in this country unveiled the shortlist for the 2015 Stephen Leacock Memorial Medal for Humour, one of Canada’s oldest literary awards. I was thrilled to see No Relation on the shortlist along with some very funny books by some very accomplished writers. My friend Zarqa Nawaz, the creator of Little Mosque on the Prairie, made the cut, along with one of my Canadian music heroes, Alan Doyle of Great Big Sea. I’ve loved his singing and songwriting for years. I only hope I might get to meet him now that his memoir has been named a finalist. It’s hard for me to believe that each of my novels has been a finalist for this very special recognition. Anyone who claims it never feels quite as good after the first time is flat out wrong. That principle may apply to other pivotal events in our lives, but for literary awards, I’m just as tickled today as I was back in 2008 when I was Leacock virgin, as it were. I offer my humble gratitude to the judging panel. 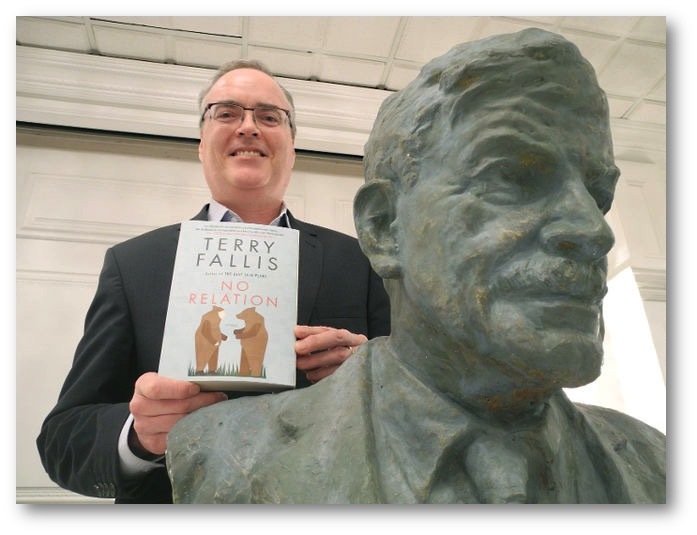 I’m over the moon and look forward to attending the Orillia luncheon on April 30th, not just to find out who wins, but also to hang out with the warm and friendly guardians of Leacock’s Legacy. Deep thanks all around and my congratulations to my fellow finalists. It’s great to be in their company. They’ve all written worthy works that we should all read.